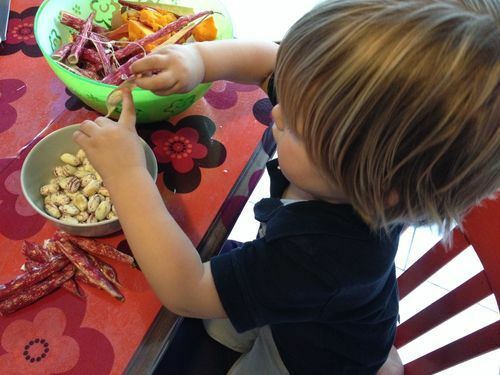 Theo was very interested in shelling the cranberry beans today, so much so that dinner was delayed because he wanted to finish by himself. It’s been cold and snowy enough that we haven’t ventured to any markets or larger supermarkets since arriving in Istanbul last Monday. Instead, we’ve been relying on the very small grocery store next door and, instead of meal-planning, I’ve mainly just been buying everything that looks even vaguely interesting and then improvising from there. Our current home is more a vacation home than a home home, and the cooking equipment is fairly limited. We’ve supplemented with some items from the local charity shop, but Brian and Theo still had to get creative and bake a chocolate cake in a pot meant for stovetop cooking. We’ve eaten lots of yummy things in Cyprus! Here are some of our favorites thus far. However, I’ve been surprised by just how much I’ve been enjoying Thai food as well – and after two cooking classes, how competent I feel at cooking several Thai meals at home. Grocery shopping in Japan is an adventure because most labels are entirely in Japanese. This isn’t so difficult when we are trying to buy things like apples or carrots, but it becomes more challenging for purchases like flour and vinegar. Sometimes, I just have to guess and hope for the best. Finding a Moroccan cooking class in Rabat was challenging – when searching online, I kept being redirected to classes Marakesh. Luckily, I eventually found the web site of Salam Cultural Center, which offers cooking classes in Rabat in addition to language and cultural exchange programs.